For Windows 8 and later use the low frame rate fix. A Quest Editor is available for making custom content. Major graphics glitches on recent AMD drivers (see Broken graphics on AMD graphics cards). 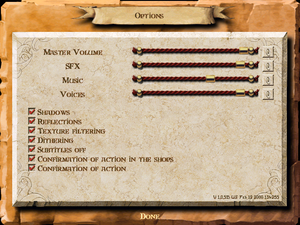 The in-game music will frequently skip and stutter on modern hardware. There is no known fix. The latest patch is v1.05b. Some previous patches are required. The GOG.com version is already fully patched. Go to the shortcut properties. Add -nointro to the end of the target. 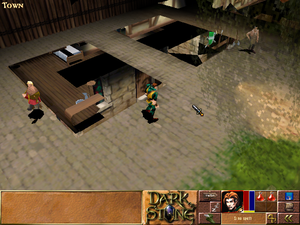 The Darkstone Quest Editor supports adding or editing monsters, NPCs, buildings and quests. Journey in Uma is an official quest pack built with the Quest Editor. Use the -32bit -window command line arguments. The 32-bit parameter must be present or the interface will be broken. Characters and buildings display incorrectly on recent AMD drivers. 3D elements are broken on AMD drivers newer than Catalyst 13.1. The -sortbyz command line argument will fix some issues but others remain. Open the ZIP file downloaded and copy DDraw.dll and D3Dlmm.dll from the MS folder. Paste the file into the installation folder. If you use a multi-monitor setup and intend to play the game fullscreen, you'll also need to extract dgVoodooSetup.exe to the folder of your choosing so you can set the display monitor to your primary (See Readme.txt, included in the ZIP file, for more details). Setting 32-bit color mode fixes the windowed mode interface. This game has frame rate issues on Windows 8 and later when running in fullscreen mode. 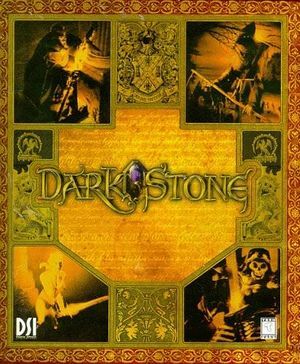 Install the Darkstone low frame rate fix. Use the -32bit command line argument to avoid flickering/invisible graphics. ↑ 3.0 3.1 File/folder structure within this directory reflects the path(s) listed for Windows and/or Steam game data (use Wine regedit to access Windows registry paths). Games with Steam Cloud support may store data in ~/.steam/steam/userdata/<user-id>/320320/ in addition to or instead of this directory. The app ID (320320) may differ in some cases. Treat backslashes as forward slashes. See the glossary page for details. Tested by using my monitor's 48 Hz refresh mode, disabling vsync, and simply running the game normally. This page was last edited on 21 April 2019, at 08:00.